These are our favorite waffles. Light, fluffy, crispy, perfect with berries or syrup. Mmmmmm…my mouth is watering all over again. As an added bonus, these freeze really well. Put them between wax paper and put them in ziplock baggies. Warm them in the toaster for a fast breakfast any time. Pre-heat your waffle iron to its hottest setting. Separate the eggs. Save the whites in a glass mixing bowl and the yolks in another. Melt the butter over a low heat, then remove it and let it cool. Beat the yolks thoroughly. Whisk in the milk, oil, melted butter, vanilla, and cinnamon. Using a hand mixer or stand mixer, beat the egg whites until stiff. Then add the sugar and continue mixing until you get nice stiff peaks. Add liquid ingredients to dry ingredients and mix gently until combined. Use a rubber spatula to gently fold the beaten egg whites into the batter — and again, be careful not to overmix. 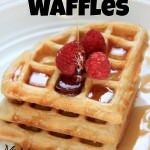 Spray both surfaces of your waffle iron with cooking spray. Pour batter onto the iron and close it. Cook until golden brown and crispy. Serve hot.